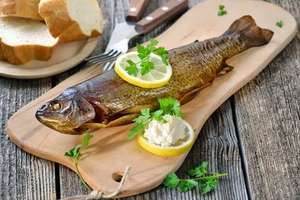 Trout is a classic alternative to Salmon and one of the better river or coastal fish available. Smoked well, Trout is a beautiful fish with a delicate flavour and a firm texture. Very popular in summer months or for special occasions. Our Trout is responsibly sourced from the best Farms, Rivers and Reservoirs. Chalkstream Trout are raised in the rivers of Hampshire, they are exceptionally large fish given time to grow and develop in fast flowing rivers. 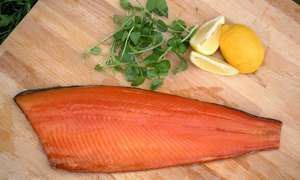 We offer whole smoked fish (sides) uncut or "D" Sliced and Hot Smoked sides and portions. Belleau Bridge is a family run Trout Farm in Lincolnshire, their fish are soft and flavoursome. 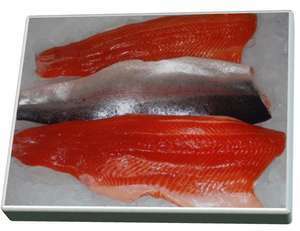 They are good sized fish and they are offered as whole hot smoked or as fillets. Either way they are fabulous eating. Our Sea Trout (Salmo trutta) are generally Norwegian Fjord fish, they are reared in the same way the Salmon is and offer a flavour and texture of a larger sea fish. They are available as whole sides cold smoked, and as hot smoked (kiln roasted) sides and portions.